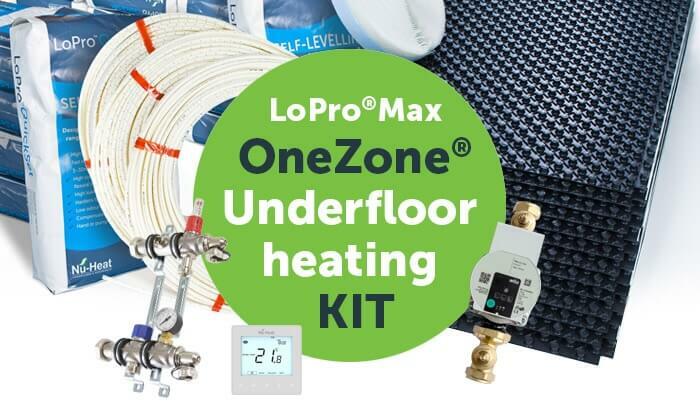 LoPro®Max OneZone is a complete underfloor heating system for renovation projects. It is low profile, at just 22mm in total, and offers high heat outputs that make it ideal for retrofitting into rooms where insulation levels are difficult to improve or where there are large amount of glazing, such as bi-fold doors. As with all OneZone® systems, it includes high quality components that offer reliability and ease of installation. You also have a choice of two market-leading thermostats; either the hard-wired neoStat or the wireless neoAir. A popular option for renovation projects, the wireless neoAir avoids the need for chasing any wires into walls, protecting décor. Like the hard-wired neoStat, it can also be easily upgraded to offer smart control functionality by adding the neoHub (please call us on 01404 549770 to upgrade). The neoAir system includes an RF switch, enabling wireless control of the boiler and pump, avoiding the need to run cabling from the wiring centre back to the boiler.